1. Hair Dryer. I have a ton of hair. I'm definitely in need of a quality blower that will get the job done faster and more efficiently. 2. Prada Candy. I'm fortunate to get 50% percent off at the end of the month so I'm going to stock up on a few fragrance sets and roller balls. 3. Guerlain Meteorite Pearls, Limited Edition Holiday 2014. I'll probably pass on these because it's red not pink. The beads complement someone with darker skin. But a beautiful beauty item none the less. 4. Gucci Cosmetics. I was ecstatic when I found out Gucci was launching its own makeup line. I purchased a number of things as an early Christmas present to myself. I plan to do a review post sometime in the next few weeks. 5. Gallery Leather Planner. I've had this planner every year for the past few and it's a favorite. Worth the splurge. I'm old school and still prefer to write everything down. 6. Guerlain Primer. I've had my eye on this for the past couple years but can't justify the price tag. I'd like to eventually add it into my collection but it would make a nice Chistmas gift for the lady who loves a bit of glamour. 7. Shiseido Future Solution Set. My favorite skincare products! Nothing beats Shiseido. My gift to myself for the year. I'll try and do an in-depth blog post on my skincare routine sometime during the holiday season. 8. Amazon.com Gift Cards. To know me is to know my love for books and getting things in the mail. Can't beat the prices on Amazon. Check out my Pinterest Bookshelf Board to see the ever expansive list of what I've been reading or plan to get my hands on next. I really need to do some more Get Lit blog features and reviews. 9. Vinyl. Thrifted, used, new, old... always appreciative of adding new music into my collection. Pittsburgh is a gold mine for vinyl- especially oldies. 10. Louis Vuitton Wallet. I really wanted the Josephine wallet in green but it sold out when I was in Paris this spring. I may be interested in the yellow one but might wait it out. I also think the 'multicolore' business card holder is adorable. 11. Satellite Radio. This one I'll probably hold off as a birthday present (Feb. 1) since I most likely won't be driving my regular car this winter because of the weather. Pittsburgh has the worst radio stations in the country. I'm confident of that. I'm not tech savvy enough to mess around with anything beyond CDs. I'm not going to invest in any more than I already have. It's time for radio. Good radio. 12. 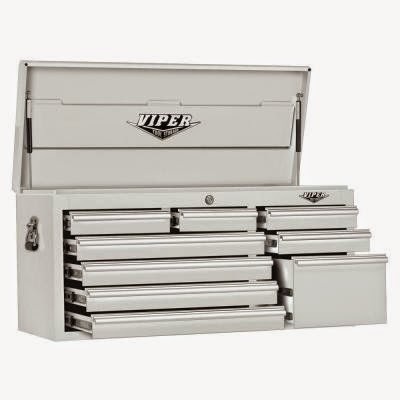 Not Pictured: Viper Tool Chest. And the item that is at the very top of my actual Christmas list is not pictured above (note to self: learn to use a new platform other than Polyvore). This beauty would lend itself perfectly to storing my makeup collection. It's pretty massive. If the majority of my stash doesn't fit, I'm seriously going to make some drastic cuts. I get excited just thinking about organizing everything. And yes, I am clinically insane. Fa la la la la la la la la!